As an internationally competitive cell and molecular biologist with highly developed expertise in signaling pathways in cancer. My research has two major foci for identifying novel treatment targets - p53 isoforms and epigenetic modifiers. One of the major focuses of my research team is the master regulator of cell life and death, p53. As a tumour suppressor p53 plays a critical role in the maintenance of genomic stability however its function is often lost in breast cancer and this is associated with therapy resistance and the development of metastases. Our novel results demonstrated that a particular p53 isoform may play a role in the regulation of chemotherapy response and hence may be a novel therapeutic target in breast cancer. My team is now investigating the pre-clinical efficacy of targeting this particular p53 isoform to increase sensitivity to anti-cancer therapies. My other research arm has identified potential epigenetic modifiers (miRNA and methylation) and biomarkers for metastatic progression in the highly aggressive breast cancer subtype of “triple negative”. We have identified several novel markers associated with metastasis and my team are currently examining our key leads for their potential as therapeutic targets. For as long as I can remember I have always loved science and in particular, biology. I’m not sure why, but I was fascinated with the human body and how it worked. This led me to study a Biotechnology degree at the University of Newcastle and then my PhD at the University of Sydney. I really became passionate about breast cancer during my PhD, because it was then, and still is, the most common cancer and the leading cause of cancer-related deaths in women world-wide. It was during this time that a personal friend of my mother developed breast cancer and I was able to see firsthand how horrible this disease can be. Although, my mothers’ friend is alive and well today, many women who develop this disease are not. It is becoming hard these days to find someone who hasn’t had a mother, a daughter, a sister or a friend that has been personally touched by breast cancer. It became clear to me, that nearly everybody knew someone who had been affected by breast cancer in some way and if there was something that I could do to make a difference to that, then I wanted to be a part of it. Although we have seen significant advances in breast cancer research, particularly in recent years, there is still so much research that needs to be done into this cancer that affects the lives of so many women. If my research can make a difference to just one person affected by breast cancer- then it’s worth it. My small piece of the puzzle might one day save a life. Breast cancer is the second-leading cause of cancer-related deaths in Australian females. Two major challenges to survival are treatment resistance and metastases. To improve survival outcomes, improved therapies are urgently required. My ultimate goal is to improve breast cancer survival – and then multiple cancer type survival - by developing novel therapies which can be used either as stand-alone agents or that can increase sensitivity to currently available therapeutics. Since 2009, Dr Avery-Kiejda is a Research Fellow and Senior Lecturer at the Faculty of Health and Medicine, School of Biomedical Sciences & Pharmacy, at the University of Newcastle and an affiliated researcher in the Cancer program of Hunter Medical Research Institute. Kelly’s expertise is in the field of molecular biology where she explores the genetic mechanisms that occur within a cancer cell that allow it to resist treatment and move to distant sites in the body. Kelly’s research has made significant advancements in the knowledge of the genetic factors that promote progression of breast cancer and melanoma, which both have a particularly high incidence in Australia and are highly incurable when they migrate to distant organs. Kelly is considered an international leader in the p53 tumour suppressor as demonstrated by numerous invitations to give plenaries at prestigious conferences (e.g. The 2nd and 3rd International p53 Isoforms Workshops, 22nd Annual Queenstown Molecular Biology Meeting: Cancer Biology Satellite) as well as academic institutions and to collaborate with her peers. As testament to her standing in the cancer biology field, she was selected a Board member of the Australasian Metastasis Research Society and the Hunter Cancer Research Alliance Implementation Science Flagship Steering Committee; groups dedicated to promotion of cancer research. Kelly has numerous peer-reviewed research articles in highly regarded journals such as Nature Communications, Cancer Research and Clinical Cancer Research and that continue to be highly cited by her peers. She has presented findings at over 50 national / international conferences and was awarded the HMRI PULSE Education prize in 2010, in recognition of her achievements as a leading early career researcher in the Hunter. 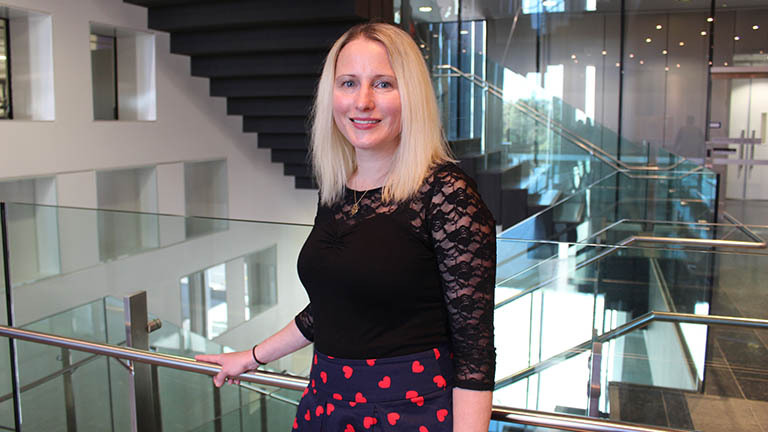 She has served on the National Health and Medical Research Council (NHMRC) Postdoctoral Reference Group which aims to provide feedback on issues of relevance to early career researchers to better the NHMRC Research Committee. She has been a member of the Cancer Australia grant review committee, a reviewer for NHMRC project grants, Breast Cancer Now UK, Cancer Society NZ and several high-ranking journals, indicating her international reputation. Kelly has received continual peer-reviewed funding to support her research from several granting bodies as a chief investigator including Tour de Cure, Cure Cancer and the NSW Cancer Council. She has been actively involved in mentoring and training students throughout her career, with 4 PhD completions and she currently supervises 4 PhD candidates. Kelly is passionate about training the future generation of researchers and hopes that she can make a difference to breast cancer outcome through her research by determining genes associated with breast cancer progression, in turn identifying targets for its treatment and prevention. Breast cancer is extremely heterogeneous and we know that this heterogeneity can account for differences in treatment responses between patients. Although tests such as Oncotype DX and Mammaprint can aid treatment decisions in breast cancer, they are: expensive, require modifications of surgical procedures to preserve the tumour sample, not applicable to all breast cancer patients and are not routinely used in Australian clinics. A low cost alternative that does not require modifications of standard clinical procedures would be of significant benefit to breast cancer patients and this is where our test comes in. We have identified several promising biomarkers in aggressive breast cancers that are associated with survival. Our focus now is to use these biomarkers to develop a predictive test that can help breast cancer patients and their treating physicians in making an informed decision about which treatment they should receive. Additionally, we are also assessing at a molecular level whether the genes we have identified could be novel therapeutic targets in preclinical models.